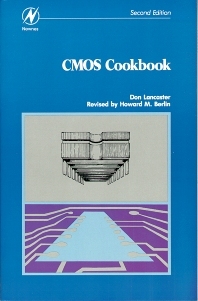 The CMOS Cookbook contains all you need to know to understand and successfully use CMOS (Complementary Metal-Oxide Semiconductor) integrated circuits. Written in a "cookbook" format that requires little math, this practical, user-oriented book covers all the basics for working with digital logic and many of its end appilations. Whether you're a newcomver to logic and electronics or a senior design engineer, you'll find CMOS Cookbook and its examples helpful as a self-learning guide, a reference handbook, a project-idea book, or a text for teaching others digital logic at the high school through university levels. President, Howard M. Berlin, LTD.